Round Bars are made of a variety of metals and manufactured to various specifications and commonly used in construction for a variety of purposes. Alloy, aluminum, steel, stainless steel, and brass round bars are available at Metals Depot. 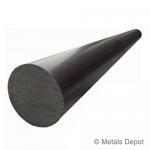 We stock standard sizes of round bar and also offer our customized cut-to-size service. Shop for 4140 Alloy Round Bar Online! 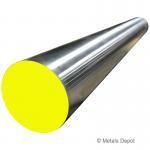 6061 Aluminum Round is an extruded aluminum product that is lightweight and has strong corrosion resistance. It is easy to weld, cut and machine. It is used for braces, supports, trim, shafts, pins, and dowels. Shop for 6061 Aluminum Round Online! 360 Brass Round Bar is the material to use when strength, corrosion resistance, electrical conductivity, and non-sparking characteristics are important. 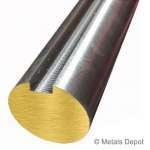 360 Brass Round Bar is easy to machine and is often used decoratively because of its high sheen when polished. It is also used in fittings, marine hardware, fasteners, instruments and more. Shop for 360 Brass Round Bar Online! 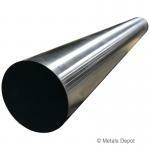 C1018 Cold Finish Round, a rolled steel product with a smooth surface and close dimensional accuracy, is a general purpose low carbon steel that works well for welding, cutting, machining, and cold forming and bending. It is used in the manufacturing of shafts, pins, axles, dowels, slides, fixtures, and more. Shop for 1018 Cold Finished Round Online! Shop for 110 Copper Round Bar Online! A2 Drill Rod is an air-hardening chromium alloy with stronger hardening, less distortion and increased wear-resistance characteristics. It has good machinability and high dimension stability after hardening and tempering. It is used for dies, stamps, punches, taps, rams, and machine parts. Shop for A2 Drill Rod Online! O1 Drill Rod is made from tool steel that can be hardened at relatively low temperatures. Its tungsten and higher chromium content makes these rods more wear resistant. It has high machinability and decarburization resistance. Some of the products made with O1 Drill Rod include dies, knives, tabs, punches, and reamers. Shop for O1 Drill Rod Online! W1 Drill Rod, versatile and priced affordably, has a high carbon content and can often be treated without heat for maintenance applications. It is tough and provides maximum wear-resistance. It has high machinability, grindability, and is free from decarburization. It is used in dies, stamps, punches, taps, knives, and more. Shop for W1 Drill Rod Online! 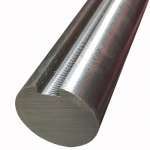 Shop for Keyed Shafting 1045 - Key Shaft Online! Shop for Stainless Keyed Shafting 303 Online! 304 Stainless Steel Round is the ideal metal when greater strength and superior corrosion resistance are important to the application. When fabrication projects will be exposed to the elements, 304 Stainless Steel Round will weather well. It is easy to weld. This product is used in the fabrication of framework, braces, supports, axles, marine, and food equipment. Sold in mill finish, not polished. Shop for T304 Stainless Steel Round Online! Shop for 316 Stainless Steel Round Online! 303 Stainless TGP (turned-ground-polished) Shafting offers good strength, machinability, and corrosion resistance; it works well for those applications where these characteristics are required. It is ideally suited for bearing shaft and axel applications where a very smooth surface and close concentricity is a concern. Stainless Steel TGP Shafting is used when exposure to the elements is an issue. Shafting, slides, axles, marine and food equipment are common applications for Stainless Steel TGP Shafting. Shop for 303 Stainless TGP Shafting Online! 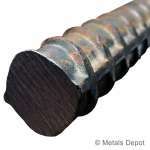 Shop for Steel Rebar - Concrete Reinforcing Bar Online! HR (Hot Rolled) Steel Round has a grainy finish and is used widely in general fabrication, repairs in industrial maintenance, agricultural implements, and more. It is easy to weld, cut, form and machine. 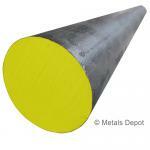 Steel Round Bar is used in framework, braces, supports, shafts, axles, and more. 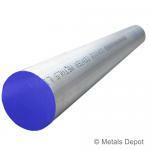 Shop for A36 Steel Round Bar Online! 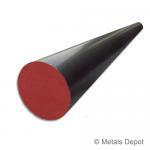 Shop for 1045 TGP Precision Steel Round Online!